Clockwise from top, a rendering of the proposed Staten Island wheel; the Ferris wheel in Toys “R” Us, Times Square; the Wonder Wheel on Coney Island; the original Ferris wheel at the 1893 World’s Fair, Chicago; the London Eye; and the Singapore Flyer, (not shown exactly to scale). Mayor Michael R. Bloomberg said on Thursday that the world’s tallest Ferris wheel would rise above the Staten Island waterfront. The 625-foot-tall ride will displace the Singapore Flyer, at 541 feet the record-holder of the moment. And what about the High Roller wheel planned for Las Vegas? The New York wheel will reach 75 feet farther into the sky. It will dwarf the 13-year-old London Eye by 182 feet and the original Ferris wheel, built for the Chicago World’s Fair in 1893, by 361 feet. As if those statistics were not enough, here are more: The Staten Island wheel will be almost three times the height of the largest Ferris wheel in the United States, the 212-foot machine at the Texas State Fair. As it happens, the Texas wheel is the same size as the Riesenrad in Vienna, which figured in movies like “The Third Man” (1949) and “Scorpio” (1973). Locally, the new wheel will be more than 10 times the height of the 60-foot one at the Toys “R” Us store in Times Square. Never mind that that wheel is indoors. The Staten Island wheel — on which construction is expected to begin in two years, with an opening goal of 2015 — will be big in other ways. It will carry 1,440 people at once, 10 times as many as the Wonder Wheel in Coney Island (which, for the record, was originally called the Dip-the-Dip). The Singapore Flyer can accommodate only 840 at a time, the London Eye 800 (the passenger load of 11 double-decker buses, according to the London Eye’s Web site). Last edited by BigMac; September 30th, 2012 at 10:40 AM. It would be great to see SI's waterfront developed. It's a massive dump with gigantic potential. It could be (and hopefully, will be) beautiful. It's about time they've added another one to Staten Island's List of Joke Superlatives since they've closed down the World's Largest Landfill. If they built it in Coney Island, I might see the merit, and even then at a stretch. At least it would be where it belongs, if this thing can even be said to belong anywhere in the city. But north of the Narrows, facing Lady Liberty... come on. Really? We're supposed to believe this will happen...I read it in the Post first and thought it was just another Bloomberg seed story but I see it's on all the news outlets now. I love the north end of SI...running the half marathons in the Bay Blvd area is a privilege IMHO but a 65 story carnival ride? Please. The planned New York Wheel development includes the world’s tallest Ferris wheel. Today, thousands of tourists and residents make a loop on the Staten Island Ferry between the borough and Manhattan, but as soon as 2016, they can also make a vertical loop on the world’s tallest Ferris wheel, anchoring a new mixed-use waterfront project on the North Shore waterfront in St. George. Mayor Bloomberg today unveiled plans for Harbor Commons, which includes 350,000 square feet of retail space for 100 outlet mall stores, a 200-room, 120,000 square foot hotel, and a massive green-roofed parking structure, but all eyes were on the projects signature element, the 625-foot-tall New York Wheel will offer stunning views of New York City and Harbor to an estimated 4.5 million people per year. The planned Harbor Commons Development includes a hotel and 100 outlet mall stores. A series of undulating ribbon-like green roof structures are arrayed at Harbor Commons that define three open-air pedestrian corridors through the site. Each ribbon is punctuated by grids skylights where north-south passages connect the corridors. “It’s about organizing pedestrian corridors,” said Chakrabarti. “We looked to create a contemporary version of an Italian hill town. The great hill towns have interesting spines.” Floor plates gradually shift as the site negotiates a 25-foot grade change. The Ferris wheel on the north side of the ballpark will take the world’s tallest title, topping the Singapore Flyer by 84 feet and dwarfing other iconic wheels like the London Eye which stands just over 440 feet tall. The $250 million wheel will contain 36 football-shaped pods carrying 40 passengers each for the 38 minute ride. The NYC Economic Development Corporation estimated that at peak season the wheel will spin up to 30,000 visitors a day. 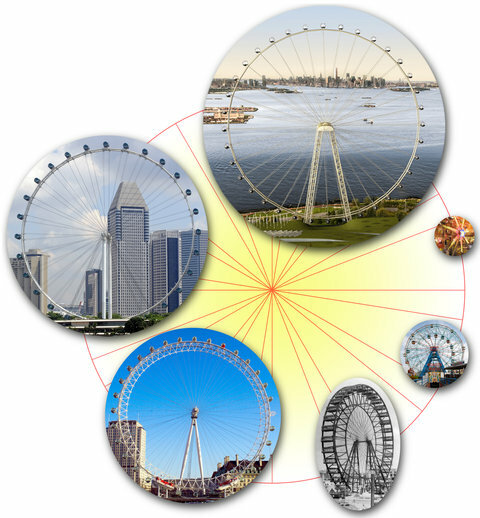 The New York Wheel’s resemblance to its London equivalent is more than passing, it’s being designed by Starneth, whose team includes members who built the Eye. Surrounding the New York Wheel, a 100,000 square foot commercial terminal building continues the theme of green ribbons roofs, adding an array of wind turbines and solar panels. The structure will include restaurant, retail, theater, and exhibition space over a nearly 1,000-car parking structure. New York Wheel and BFC Partners will sign a 99-year lease for the two development sites and plan to begin construction in early 2014 with an anticipated opening in 2016. I think I'll wait & see how it does on an exceptionally windy day with other people on it before I give it a try. Will have awesome views for miles around, though. The one on the Wildwood boardwalk still ran unless it was raining, even with the wind howling it up. Everyone seems to have London Eye envy. Really, I don't find ferris wheels particularly interesting. Last edited by BBMW; October 1st, 2012 at 08:54 PM. Make it 1000ft, then we'll talk. The overall plan with the retail is atrocious. I think this will become a dump quite quickly (it already is, but I'm sure it'll do well for a year or two once it opens). I would turn the SI landfill into a world-class airport (shut down Newark), then run a train with stops at St. George, Fulton, 34th, and 42nd Streets. Like Hong Kong's, but even better--St. George could be massively redeveloped as well. Unfortunately we have this terrible plan that lacks any ambition. The Ferris Wheel is kind of cool, but the retail podium is ABOMINABLE. It's completely anti-urban and they're expanding parking for an OUTLET MALL of all things. St. George is the only place in SI that could eventually become a walk-able urban hub, and it's a shame that prime real estate has been wasted on a baseball field and this load of crap. The SI Yankees are a big draw, it's not like it's a little league field. They will never shut down Newark just to put an airport in SI. There's no motivation for them to b/c EWR is too conveniently located to major highways and NYC. They'll just tell people use the Goethals Bridge. Retail I'm up in the air about, at least it will keep people from coming to NJ. I hope they have a better plan for the base of that wheel than what is basically pieces from an erector set. I'm no engineer, but a wheel that size needs solid legs and wider footprints. I'm no engineer, but a wheel that size needs solid legs and wider footprints. Modern wheels use tensioned cables; less mass. Looks like a giant bicycle wheel. They're actually incredible structures.